But did you know that there are many more passion plays in Europe? 2018 in Sömmersdorf (Franconia), 2019 in Erl (Tyrol): Don't wait until 2020 - make a passion play an ongoing part of your travel programs. Start planning your tours and Pilgrimages now. 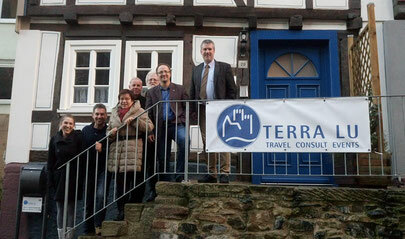 Whether you are a big tour operator or a local travel planner: We at Terra Lu Travel are your specialist B2B supplier for church travel and pilgrimages in Germany and central Europe. We are a German company with best local contacts on site and will put together "hand crafted", customized tours just for you and your groups. In 2017 we are one of the leading local suppliers for tours to the Reformation Jubilee. We will get you the tickets for all Passion Plays and also make your additional travel arrangements for great tours. Working on your behalf, as your B2B service partner on site, we keep our name hidden. Your travelers will only see your company's name and will always know: It's your tour. Take your groups 2018 to Sömmersdorf in Franconia, 2019 to Erl in Tyrol, and 2020 to Oberammergau. Contact us to discuss details now. Your Germany based, B2B group travel service for the passion plays. We get you the tickets and hotels. We arrange all tour program in Europe. We are your B2B partner on site in Germany. We keep our name hidden, supporting you to serve your clients.